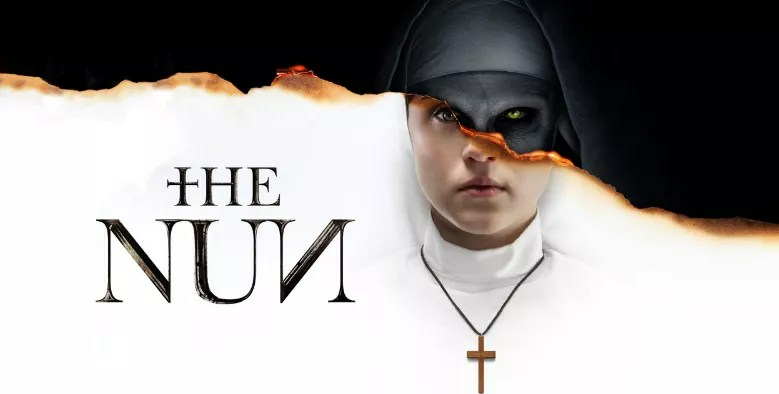 The Nun – In July I went to Comic-Con in San Diego, which is always a highlight of my year. But on my last night there this time, something happened that haunts me to this day. I was basking in the joy of being surrounded by “my people” (read: nerds), and had just finished up a nice stroll along the marina promenade with a group of friends after several hours of running around in the heat, getting our fangirl on. We had made it back to the main convention center and were about to cross the trolley tracks to go get a late dinner in the Gaslamp Quarter when we came upon a few dozen nuns standing in a row. That’s right. A few dozen nuns, just standing there in a row doing nothing except holding their hands in prayer. But they were not normal nuns — they all looked to be wearing black ski masks with no eyeholes. At first we just stared at them, trying to figure out what was going on since they weren’t doing anything. That’s when I snapped this pic. Then we debated whether these people were cosplayers and if so, what were these sinister-looking nun characters from? A small group had gathered to stare at them, and none of us could think of a movie with nuns like this. That’s when the nuns simultaneously started chanting something, urgently, in low voices — it sounded to me like they were speaking in tongues. I was like, “Guys, this is creepy as hell and is weirding me out. How would we even know if these people aren’t cosplayers?” And then just as I said that, the nuns broke into a run and started chasing us! It was like they had telepathically communicated with each other and had each targeted one specific person and ran at them full-force, still scream-whispering scary chants. So of course we were like “GAHHHHH!!! !” and busted away from them, but I mean the nun who chased me definitely got close enough to have whisper-chanted stuff right in my ear. I was unnerved, wondering if I had just been legit cursed by an evil nun. And before you roll your eyes, there were some other people by us — including grown men — who were freaked out by it all as well and together we started debating what in the heck just happened once we’d made it across the trolley tracks to safety. This was 1.5 months before The Nun came out. There had been no marketing for the movie that any of us had seen before that point, so we had no idea what was happening or what this experience could’ve been tied to. But it scared the bejesus out of me and I DID NOT LIKE IT. And if I told you all of the weird nun-related things that have since transpired to the group of friends I was with that night, you wouldn’t believe me. So I still think we were truly nun-cursed in some way that night. Marley & Me – I love dogs. I have a dog. Dogs don’t dress up in wicked nun costumes and chase you. There is a dog in this movie. I know what happens to him. I don’t need to sob my head off and be depressed. And that is why I will never watch Marley & Me. So… make me feel better. What movies do you never intend to see?